I think it’s safe to say that everyone experiences emotional dissonance at one time or another. It’s a perfectly normal experience but it’s an uncomfortable one and there aren't a lot of helpful options. I always look to the plant world for answers and for this issue I found tulsi. If you don’t mind a bit of an over-share, I’ll tell you why this plant is such a strong emotional ally for me. 2015 was a really difficult year for me. I was unhappy in my personal life—finding that I was easily triggered by past stressors and in a continual state of aggravation. It was starting to affect other areas of my life so I decided to see an herbalist. He kept putting tulsi in all of the formulas he made for me and was insistent that it was the plant ally that I needed. The problem is that the tulsi was giving me a stomachache. It was a no-joke stabbing pain in the pit of my stomach, right where my third chakra (the place of ambition, personal identity, and courage) is located. I tried to stay away from it but I couldn’t! With my herbalist, within my herbal friend group and in my personal research, tulsi kept coming up as the herbal ally that I needed. Then I remembered that sometimes in herbal medicine, a plant teaches a practitioner how to work with it through causing the distress that it cures, so I pushed through the pain and meditated with the tulsi. Low and behold, I had a flash of real insight. In that instant, I felt like something inside of me was unlocked, the stomachache dissipated (it hasn’t returned since), and I felt safe to feel the emotions that I had been blocking—truthfully, I cried for a really long time. That meditation with tulsi inspired me to make some difficult changes to my life that have completely transformed my personal journey. That is the power of tulsi. While I can’t back this up with science, there is a lot of lore around this herb being used in this way and sometimes that sort of history holds power. Another name for tulsi is holy basil and the sacred lore about this plant transcends cultures. Most notably, in the Hindu tradition tulsi is associated with the god Vishnu and Vrinda, his greatest devotee. Vrinda died of shock and heartbreak when Vishnu tricked her into believing he was her husband. Because of how devoted she was in life, it is said that she returned as tulsi and no prayer to Vishnu would be complete without the plant. Vishnu is the God known to keep the universe safe in the midst of the chaos between creation and destruction so when a person is working with Vishnu (and tulsi), it is to ask for safety and prosperity along their journey through life. In both ancient Indian culture and the ancient Egyptian culture, tulsi was used in sacred death rituals to bathe the dead—the Egyptians even used the plant as part of their embalming process. In cultures all over the works, like Mexican and European, tulsi is seen as protective and an herb to bring luck and prosperity. She is often associated with love, like in Italy where a woman will leave a pot of the holy plant on her balcony when she wants to see her lover. Tulsi is seen as a way to ward off evil by sprinkling it around on the ground. The Roman Orthodox Church uses holy basil in ritual, because it is said to have been growing at the site of Christ’s crucifixion. In this way it is seen as a connection between death, life, and rebirth. Clearly there is a theme with this plant. A connection to protection and transformations but that isn’t all, tulsi is an absolutely amazing herb to use in physical healing too. Tulsi has so many uses that it’s hard to name them all. Here are a few of my favorite ways to use this plant. We’ve talked extensively about adaptogens before so I won’t go too much into them here, but tulsi certainly falls into this category. She helps with stress and adrenal fatigue over time by affecting the adrenals. Paired with the antispasmodic and nervine action, this plant is a knock-out for short and long-term stress. My medicine maker will often tell a story about drinking tulsi tea everyday for months while he was in school and not noticing too much of a difference until he stopped drinking it. Within a few days he felt much more affected by stress and anxiety than he had been while he was drinking it. This points to the gentle, but powerful nature of this herbal ally. This seems almost obvious because it is a green plant related to basil but it’s super important to mention! 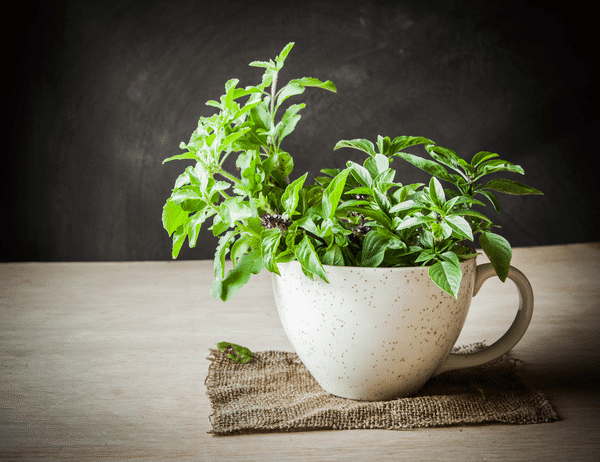 Tulsi is packed full of antioxidants, iron, vitamin C, magnesium and a whole slew of phyto-nutrients. I always add it to my iron tonic tea recipe during my menstrual cycle or if I’m feeling drained. Tulsi is an antimicrobial herb! This shouldn’t come as too much of a surprise because of the historical uses. Most herbs that are used to protect the user or ward off evil (like tulsi or lavender or rosemary) are actually anti-microbial. People would use it in tea or sprinkle the leaves around the floor and sweep it up after a while – before science knew that microbes and bugs caused sickness, people often referred to it as the ‘evil eye’ – and it would keep sickness and disease transferring bugs at bay. Tulsi is great during a chest cold or bacterial sickness involving the lungs, especially if a person is congested or achy. There isn’t really a better way to describe it. Tulsi moves things—emotionally yes, but also physically—the herbal actions associated with tulsi are things like diaphoretic (makes you sweat), circulatory stimulant (moves the blood), emmenagogue (helps to start menstrual flow), bitter (stimulates digestive system), and expectorant (helps to move mucus out of the lungs). A flower essence is a remedy that uses just the flower of a plant to help with the connection in the subtle energies between the physical and emotional aspects of life. The tulsi flower essence (and actually, more broadly the basil flower essence) helps to bring a greater understanding of our own nature. It helps to harmonize our emotional, sexual, and spiritual lives so that we can perceive the world as part of a sacred whole. This is a lovely essence for someone that feels shame around their body or that has a hard time reconciling with their own sexuality. Do you work with this plant? Tell us your favorite way to work with Tulsi in the comments! Wow, thanks for the reminder about tulsi. I have used tulsi tea in the past. I especially enjoyed a blend that had some licorice root in it, which gave a natural sweetness. I definitely felt it helped with stress and with balancing energy. I tend to be extremely high energy, then exhaust myself. I think tulsi helped to balance that a bit. I haven’t used it recently…I’m constantly coming up with fun new concoctions for my happy, healthy and hot blog and kind of fell off the tulsi bandwagon. I’ll have to give it another go!